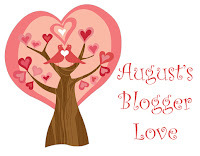 Being that it is August, that can only mean one thing, time for some blogger love. That's right, as we do every month, we like to say thanks to all the bloggers that we know and love because they know and love us, and of course because we have a nice little network with each other sending traffic and new readers a like back and forth to each other. We will keep it simple this month. Thanks to all of you for doing what you do, and for being who you are. There you have it folks. Our blogger love. Thank you all again for all that you do. Now, everyone go check out these blogs, get inspired, and get outdoors.